Now, let me say that I don't typically feel bad for Shadow Thief. I mean, let's face it -- the man is a Grade-A Jerk. But in last week's Justice League of America #34, he gets overwhelmed and defeated by Dr. Light, then bound by Firestorm. That last panel -- yikes! Should have hung up the Dimensiometer, Sands! Summary: Carter takes Shiera to see "Satana," an animal act featuring her trained tigers. During the performance, though, tragedy strikes when one of the tigers mauls a guest. Satana says the the animal will be destroyed, but Carter spies a little smile on her face when the man is killed, and is suspicious. He follows her back to her laboratory as Hawkman and discovers that she is experimenting on the tigers. A little research yields that she is actually Sara Descarl, a surgeon who perfected a method for brain transplants. Armed with a hunting knife, Hawkman returns to the lab and confirms his theory that Satana has transplanted human brains (and eyes) in the tigers' bodies. She orders her cats to attack the hero, and he is forced to kill both of them. Satana tries to shoot Hawkman, but he disarms here with a well-thrown knife, then turns her over to the police. Review: A strange little story which features quite a lot of violence, even for a Golden Age story. Moldoff does his usual good work here, including a funny panel with the human-brained tigers sitting around, smoking and reading the paper. This is more in line with what I think is expected from GA superheroes than the last couple of stories, and it's not a bad read -- bewarned, though, that the reprint in the Archive Edition has the pages out of order. Image: Flash Comics #13, 1941, Sheldon Moldoff. Not sure where this coloring page was originally from, but the site I got it from had lots of DC heroes (along with other toons) for you to print out and color... with your kids, of course. Obviously. Duh. Anyway, I like the overall look here, which looks like it dates to the Superman: The Animated Series era: more angular and striking in design than the original Batman-era. Some of the details are a little odd, like the throwing star on his bicep, but they would make for good coloring fodder. The oversized Honor Wings look great, and the wings look appropriately dynamic. The mace is, as always, a welcome touch. I'm going to have print some of these out and keep them for my son... when he can color in a couple of years. 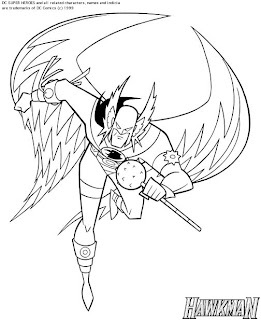 Image: Hawkman coloring page, retreived from Toons & Comics Coloring Pages, retrieved in 2009. Well, readers, there does not appear to be anything coming out this week which features Hawkman or Hawkgirl, so I figured I would take this opportunity to look over some of the other DC releases this week which tangentially relate to the Winged Wonders. Golden Age Starman Archives v.2 HC -- Besides Starman being Hawkman's teammate in the original Justice Society, this volume is intriguing in that the only other Golden Agers to get a second Archive collection previously are Green Lantern and Flash (discounting durable folks like Superman and Batman). Could this foreshadow a second volume for Hawkman as well? I would snap that right up, beefy price tag and all, as I have been thoroughly enjoying Volume 1. JLA Deluxe Edition v.2 HC -- This is the second hardcover collection from Grant Morrison's "Big 7" era of the League. Morrison has always been hit or miss for me, but his JLA stuff is great. It's interesting to see Zauriel in action considering his real-life origins as a "new" version of Hawkman. Justice Society of America #28 -- I have not been getting JSoA since Johns and Eaglesham left -- and that's not a knock on the incoming creative team so much as it is a desire to have a break from the team for a little while. The fact that neither Hawkman nor Hawkgirl is a member of this team is plainly indicitive of the changes upcoming in Blackest Night. It's telling to me that one of the first things Johns did on his last story arc was to have Hawkman leave the team. Considering the plans which McDuffie had for kendra over in JLoA that ended up not happening, I'd really like to see her back over in the Society, assuming, of course, that she survives Blackest Night... which my speculation doesn't support. Time will tell, as always. Title: "Fury of The Exiled Creature!" Summary: Exiled Atlantean Tyros discovers a mysterious gem, which gives him the power to transform in a creature who can cause havoc both in the water and in the skies. Using his new powers, he incites a narwhal to attack Atlantis for him, hoping to take control of the city he was once a citizen of. Aquaman and Aqualad intervene, however, and are able to stop the assault and spare Atlantis for the time being, though they are unable to catch Tyros. Moving to the skies, Tyros seeks out and steals the Horn of Quixtol, an ancient artifact which gives him dominion over birds. This attracts the Winged Wonders, Hawkman and Hawkgirl! They battle the beast, but Tyros is able to fend off his foes by turning Hawkgirl in a harpie under his mental command! 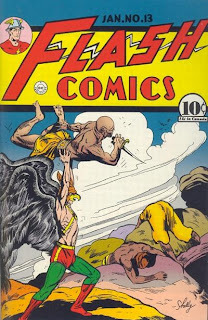 Hawkman is forced to retreat but vows to rescue his lady love and stop Tyros. Tyros, meanwhile, takes the opportunity to attack Atlantis again, pummelling the city walls with various undersea creatures. He threatens the inhabitants that either he will rule the city, or it will be destroyed! 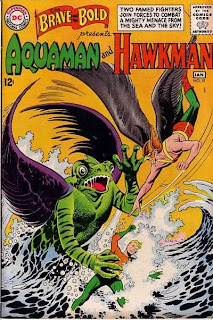 Hawkman and Aquaman run into one another and decide to team up, taking a divide and conquer approach. Hawkman is able to strip Tyros of the Horn, while Aquaman tracks down and smashes the gem. The artifacts broken, Tyros and Hawkgirl revert to the their normal states, and the Atlanteans retake the city, casting Tyros out once again. The heroes exchange their thanks and head off on their seperate ways. Review: A typically insane but also insanely fun Silver Age team-up, as the Winged Wonder and the King of the Seven Seas join forces to take down a common foe, with plenty of monsters and magical artifacts thrown in for good measure. Bob Haney is in top form here -- I would say "rare form" but he pulled this sort of stuff with regularity. Artist Howard Purcell, who handles both pencils and inks, does a good job on the monsters and beasties, even if his heroes are a little off model. Man, imagine Joe Kubert drawing this?! But still, he is a good choice for the story and his work is very eye-pleasing. My little write-up cannot encapsulate the awesomeness of this tale, so be sure to check out more in-depth write ups over at The Aquaman Shrine and Mail It To Team-Up. Or, pick up a copy of Showcase Presents: Hawkman v.1 (or Showcase Presents: Aquaman v.2, if you'd prefer) and read it for yourself. Image: The Brave And The Bold #51, 1963, Howard Purcell. "Who is Hawkman now?" "[Wait] for it, wait for it, wait for it," [Senior Story Editor Ian] Sattler said. "Blackest Night. It's coming soon." Pretty cut and dried, huh? Of course, Wednesday Comics will feature Kyle Baker's Hawkman. I'm still not sold entirely on Baker's style for Hawkman, but I guess I will need to see it in person first. I now return to sitting on my hands, champing at the bit for Blackest Night #1 and the fate of the Winged Wonders. Our sketch today is from an artist named, evidently, Evan, initials ERD. I found his site, Studio-Hades, while poking around an image search engine, and discovered this quite-nifty Hawkman commission amongst his sample work. The piece is simple enough, with a pose which Hawkman has struck many times in Justice Society or Justice League meetings and when resisting slugging Green Arrow in the face. But Evan does a really nice job of portraying the quiet power and strength in his arms and chest, like a coiled spring. I also like the slightly downturned mouth, as if Hawkman is slightly annoyed at whomever he is listening to (again, Green Arrow is a likely candidate). The wings look great in repose here, including the nice work of picking out the feathers without making the whole thing look busy. The belt buckle is a little ostentatious but I like it in the way that wearing a belt buckle of your initial is a sign of badassedness (see also: Aquaman, Apocalypse, Galactus). Overall this is a great piece and I am sure whomever ordered the commission was very happy with it (I know I would have been). The only complaint I have, and trust me, it's minor, is the beak on the helmet looks a little long, kinda like The Shrike, if anyone remembers him. If anyone out there knows more about this artist please comment and share! 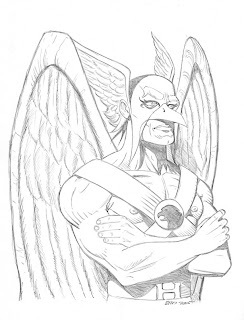 Image: Hawkman sketch, 2005, "Evan", retrieved from Studio Hades. As the title suggests, major gains were made were made this week in my Hawkman collection. Since I am not going to be heading up to Charlotte for HeroesCon this year, I instead decided to take some of the money I would have spent there and treated myself to a big online order instead. Ironically enough, the box arrived on Tuesday -- my birthday! Combined with my nex HDTV and baby son, it's been a pretty rocking couple of weeks! Showcase #102-103 -- I found #101 almost at random at a small show last year, and really dug it, so these two were top of my list. The first Rann-Thanagar War is now in my collection! Hawkman v.2:no.2-9, 11-14, 16-17 -- ... since they follow up on it. Between the finds in discount bins over the past year and this batch, I have the complete run of the Shadow War-tinged volume, of which I have read exactly -zero- issues. Hawkman v.3:no.0, 2-33, Annual 1-2 -- Similarly, I now have the entire run of the third volume, of which I have read two issues (and one of those was about 15 years ago at this point). This series has taken on a "If I knew then what I knew now" status for me over the last few years, but at least now I can enjoy it at my leisure. Hawkman v.4:no.2-3 -- Completing the first story arc from the latest volume, I got tired of trying to find the collected edition and started buying singles when I saw them cheap. Johns, Robinson, and Morales are in top form herein. 57 issues in total -- one big box of Hawk-goodness which is going to take me a good long while to read through! And while this has made a huge dent in the collection, I'm still not done! For one thing, I need to finish Volume 4 -- most of which can be done through collected editions but there are still 8 uncollected issues I will need to find. Then of course, there is Hawkworld, of which I have exactly one issue. Rounding out the list are the Hawks backup appearances (what DC would call a "co-feature" nowadays) in the pages of Detective Comics and World's Finest, plus a few issues of Guy Gardner: Warrior and Justice League America to complete a crossover with Volume 3. But that's another matter -- I've got enough Hawkman here to keep me occupied for months if not years, the speed I read. So here's to uncovering more and more of the history of the Winged Wonder. Is there any Hawk-related stuff coming out at your local comic book retailer this week? Let's take a look! Yikes. I guess until Wednesday Comics I had better get used to these "light" weeks! Hang in there, Hawkfans! Strange Adventures #4, the latest installment Jim Starlin's current DC Cosmic opus, seemingly puts to close the ongoing (on this blog, anyway) debate over Hawkman and his place in the Abberant Six. For those coming in late, the Abberant Six are, from what we know, six individuals destined to both aide and battle against the godlike Synnar The Demiurge at some indetermined point in the future. This group was first mentioned in the frequently-referenced Hawkman Special, and was fleshed out a little bit more in the balance of Rann-Thanagar Holy War (including the Adam Strange Special), and has become a minor focus of Strange Adventures. That pretty much puts it all out on the table, doesn't it? I know the online attitude is that Starlin wrote the Special and then Geoff Johns got mad at him and "made" DiDio change it, but I don't buy that. Especially considering that Starlin said he was charged by DiDio to write Hawkman as a Space Cop. Personally, I still believe in my personal speculation -- that after Hawkman and Hawkgirl died in Final Crisis, we would have gotten Katar Hol for Starlin to write, Carter Hall and Shiera Hall for Johns to write on Earth-2 (with the Justice Society Infinity), and zombie Kendra Hall for Johns to use in Blackest Night. But with the redaction of their deaths, that changed things and now, as Synnar says, reality is in flux. Still, even though Hawkman will not be a player in this series, I have to say that sometimes, things just work out: I am totally enjoying the heck out of Starlin's current output and would not have gotten into it if not for Hawkman. So even though the Winged Wonder is out, my interest is still piqued. One thing about Hawkman and Hawkgirl having been a couple for so long is that typically if you get one, you eventually get the other. That's the case here with this DCUC Hawkgirl toy. You will recall that I picked up the DCUC Hawkman figure a few months back (who, unfortunately, is still encased in his bubble because I keep putting off rearranging the shelf to fit him). So I will certainly be on the look out for this classic, Silver Age style Hawkgirl to display with him once she is released. I am not sure what kind of accessories she will come with, but judging from the mold of her fists, a spear might be a fair guess. The rest of Wave 8, of which Hawkgirl is a part, contains other characters tangentially related to the Hawks. Doctor Fate (both in his classic look as well as the modern version) was a fellow member of the Justice Society of America, and Commander Steel (who also is on my buy list even though I shouldn't spend the money) was a member of the All-Star Squadron. Rounding out the group is classic Hawk-baddie Gentleman Ghost -- another one I am going to have to resist purchasing. 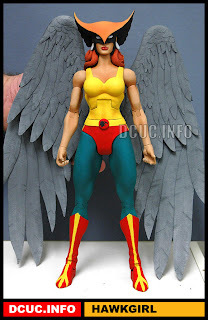 Image: DCUC Hawkgirl, retreived from DCUC.info. 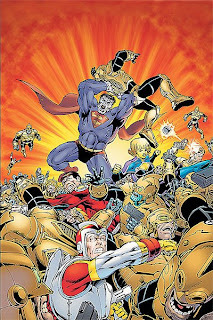 As you may know if you reading this blog, legendary comics creator Jack "King" Kirby handled the Super Powers Collection tie-in comic for DC in the mid-80s. The series ran for three short volumes, and featured Kirby's work on a lot of characters he did not get to normally draw, including Hawkman. Jack Kirby was involved at some point with developing a Hawkman cartoon series which never got off the ground, as seen here. His Hawkman in Super Powers is more closely modelled after the toy, with the smooth wings, but that's alright because I dig the toy, too. All in all a very cool image showcasing who were, to me as a kid, THE pantheon of DC Superheroes. I snagged this image from rob! 's legendary Aquaman Shrine, pretty much the standard for daily superhero character bloggers. Thanks, rob! Well folks, my wife and I are back from the hospital with our brand-new son, our first child. As such, updates are going to be sporadic-to-non-existant for the next few weeks while we all get used to the new routine.